A long, bizarre night in Muncie that lasted until 3 am, started off with a marathon baseball game - and that was the short part. After 4 innings Friday night, Carmel Post 155 was down 8-7 to Jay County, who had beaten them 14-9 just two weeks ago. Carmel had 7 hits in the game, but had made 6 errors through the 4th. With the game getting more out of hand each inning, Carmel pitcher Austin Jackson stepped in and restored order to everything. Jackson was at the top of his game as he threw six dominant innings, striking out 7, giving up just 2 singles and one unearned run through the 10th. In the bottom of the 10th, Ben Backes drilled a single through a drawn-in Jay County infield, and Carmel had their first post-season program win, 9-8. Carmel dropped both their games on Saturday to conclude the 2009 season. 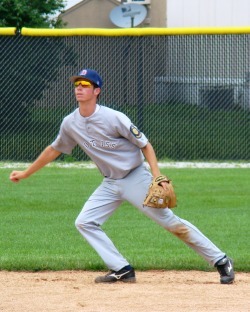 Carmel Post 155, likely the youngest Senior Legion team in Indiana, had a sucessful season with several wins against teams rostered not only with many 2009 high school grads, but also with players with one year of college ball under their belts. 12 of the 13 Post 155 players return for their senior year of HS baseball in the spring of 2010. It was gut-check time at Hartman Field on Tuesday night in the top of the third inning, and Post 155 pitcher Brian Bolin was up to the task. Anderson Post 127, who had beaten Post 155 16-5 two weeks ago, was leading 3-2, and had loaded the bases with no outs on a walk, an infield single, and an outfield error. Bolin dug down deep and struck out the next two batters swinging, then coaxed a grounder to second to end the inning and swing the game momentum back to his Carmel team. Doug Campbell, Jimmy Midence, and Cole Martin each had 3 hits, and Evan Butz had a 2-RBI double in the 5th. 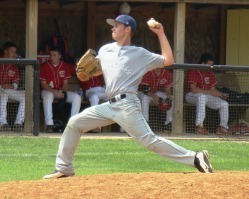 Bolin threw seven strong innings, striking out seven, and scattering just 4 hits. He retired 16 of the last 18 batters that he faced, giving his team a chance to come back for the win. With Anderson chipping away at the Carmel bullpen in the 8th, left fielder Austin Jackson fielded a single and threw a strike to Carmel catcher Drew Brown that nailed the baserunner at home and ended the inning. 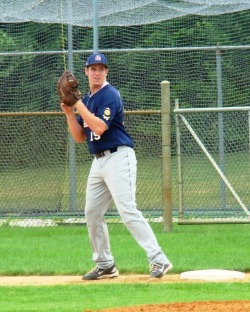 Robby Shea pitched the ninth inning, striking out the side, and Post 155 had a 10-6 win. In a "defensive struggle", Post 155 was able to deliver 12 hits to outlast the Indiana Mustangs Tuesday night at Hartman Field. Drew Brown, Jim Midence, and Conner Ewing each had 2 hits for the Post. This weekend the team returns to Muncie to play Vincennes, Anderson, and Muncie. Pitchers Michael Moreno from Kokomo and Chris Hoopingarner from Post 155 became mirror images of each other over two hours and seven innings of well-pitched baseball from both sides on Tuesday night at Hartman Field. Both pitchers scattered only a handful of hits and walks - Moreno allowed only 4 baserunners past 1st base - Hoopingarner gave up only 5 hits and had excellent defensive help. With the score knotted 1-1 in the top of the seventh, Robby Shea (3-0), came in for Hoopingarner, struck out 2 batters, and then Jimmy Midence rushed in from right field to grab a sinking liner to end the inning. Carmel then strung together two hits in the bottom of the 7th with Drew Brown delivering the game winning hit. 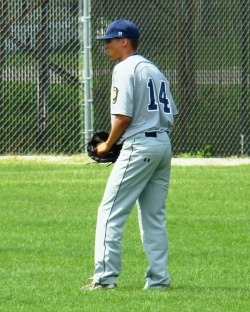 Baseball fans from Post 155 helped the team kick off the season at Post 155's home opener on June 21 at Hartman Field. Sam Haskett, Don Hudson, Mo Harrelson, and Harry Meyer all took turns throwing out the ceremonial first pitch to Carmel catchers Doug Campbell and Drew Brown. 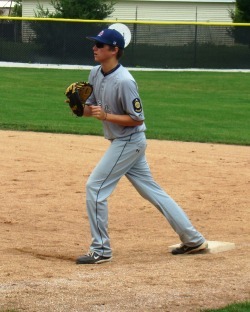 Chris Hoopingarner went 3 for 3 with a walk and Bryan Larson busted out with a 4 for 4 game to give Carmel the offense that they needed to notch a 6-5 win over the Lafayette White Sox Saturday morning in Bloomington. Jimmy Midence and Conner Ewing also had two hits for Post 155. 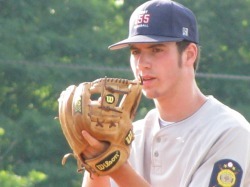 Robby Shea (above pic) scattered six hits and went all seven innings to move his record to 2-0 on the season. In the nightcap game in Bloomington, Bryan Larson threw a strong 5 innings against the Indiana Renegades, striking out five. Carmel fell behind early but continued to come back and chip away at the lead. The game was called due to time limit after six innings with Carmel down 5-4. Continuing their hard work with an eye on college, the Post 155 team posted a team average Grade Point Average of 3.5 for the spring high school semester. Team Academic Advisor Leslie Brown said, "the team actually exceeded the GPA they had in the Fall Semester by a little bit. Just more good work by a great group of kids. Their cummulative GPA also went up. The guys are really working hard and positioning themselves well for when it comes time to make their college choices." When Carmel pitcher Bryan Larson entered Saturday morning's game in the third inning, his job was simple - to give his team a chance. Carmel was down 5-1 to Evansville Funkhouser, and looking at a long day still ahead on top of a 300 mile one-day down and back drive from Post 155 to Vincennes. Larson did his job, and gave his team a lift that would last all day. While he gave up only one run on three hits over the last five innings, his teammates went to work. Nick Logan, Doug Campbell, Conner Ewing, and Robby Shea each had two hits in the game; but Post 155 was still down 6-4 and had the bases empty with 1 out in the 7th. 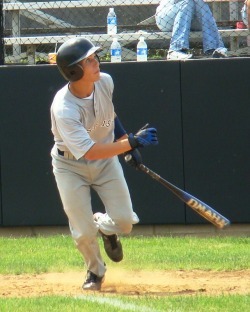 Ewing then singled and was replaced by pinch runner Chris Hoopingarner. Shea then doubled deep to left center scoring Hoopingarner to make it 6-5. Larson drove Shea in with a single to make it 6-6, worked his way to second, and up to the plate came Evan Butz. "I was seeing the ball well, and having good at bats that day, but had nothing to show for it through the seventh," said Butz. "I was pretty happy to get one more chance. I just wanted to hit it hard and come through for the team." Butz ripped a hit to left center, Larson (fittingly) raced home, and Post 155 had a 7-6 win. The nightcap vs Princeton at Vincennes University had a deja-vu feel as Carmel was again down 5-1 after four innings. Cole Martin came in to pitch after four, and held Princeton scoreless the last three innings of the game. In the sixth, Carmel strung together hits by Nick Logan, Butz, and Campbell; and walks to Shea, Ben Backes and Drew Brown to pull within 5-3. Princeton got two quick outs on Carmel in the seventh and was one out away from the win with the bases empty. Backes, who was not ready to go home, singled. Butz drew a walk and the runners advanced to second and third when a ball skipped away from the catcher. 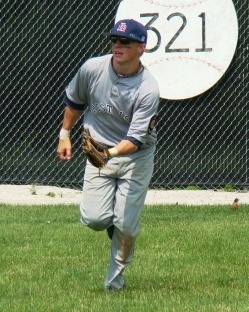 Drew Brown then drilled a single to right field to score both runners and tie the game. Brown worked his way to second and then Nick Logan delivered his third hit of the game, scoring Brown and putting Carmel up 6-5. Martin then held Princeton scoreless in the 7th, and Post 155 had their second victory of the day. "I don't think the heavy stuff is gonna come down for quite a while"
On a rainy night at Lafferty Field in Muncie on Monday, Carmel Post 155 earned their first victory of 2009 by an 8-3 score over the Muncie Chiefs. 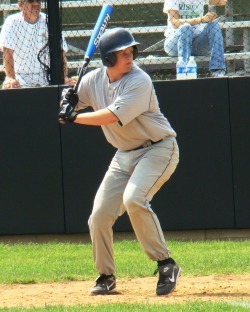 Nick Logan set the tone for the night with a first-pitch lead off double and Carmel scored 4 runs in the first inning. Doug Campbell, Jimmy Midence, and Ben Backes each had two hits for Carmel. 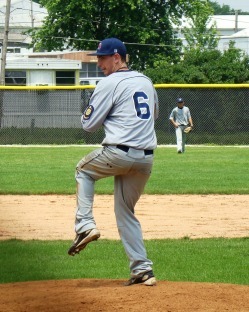 Robby Shea pitched six strong innings for the win, scattering 6 hits and holding Muncie to one run. Cole Martin pitched innings 7-8-9 to close out the game. The first-year Post 155 team was appreciative of the opportunity to play at, and learn about the history of Lafferty Field. The team will play at Muncie several more times this summer in tournament format. We at Post 155, would likely not be going out this summer as a first year American Legion team, without the mentoring and help we were fortunate enough to get from John Miles over the past several months. We had been looking forward to seeing him in the sunshine and on the field this year. 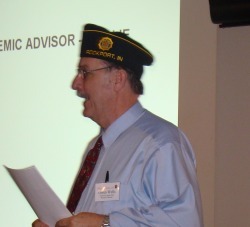 He was a new friend of ours and a longtime leader in American Legion Baseball. On May 14, at Carmel High School, 2009 Post 155 players Conner Ewing, Ben Backes, Robby Shea, and Drew Brown received 2008-2009 Scholar-Athlete Awards. This is awarded to Carmel students that are part of an athletic team during the school year who also achieve a 3.6 GPA or better during the first semester of the year. Robby Shea also received The Athletic Director's Honor Roll Award, for having the highest GPA in the baseball program during their "in season" grading period. Shea also received Metropolitan Interscholastic Conference Academic All-Conference Honors. 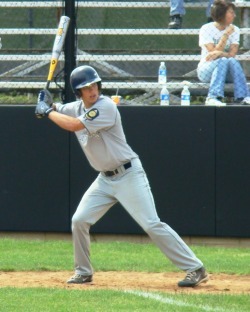 Carmel American Legion Post 155 announced today that Kyle McLaughlin will be the head coach of the 2009 baseball team. Kyle is a graduate of Lawrence Central High School, where he was the starting catcher on the 2004 State Championship Baseball Team. Following high school, Kyle attended Butler University, where he received a Bachelors Degree in Physical Education and Exercise Science. Kyle was a four year letterman for the Butler baseball team. Carmel juniors Brian Bolin, Robby Shea, and Bryan Larson at the CHS National Honor Society induction on Sunday, March 29. The NHS accepts members based on the high school student's performance in the areas of scholarship, service, leadership, and character. All 11 members of the Post 155 team saw their classroom and study work pay off and contribute to a team Grade Point Average of 3.5 for the Fall Semester. The team's cumulative High School GPA rose to 3.4 as the players continue to academically achieve during their important junior year in High School. Post 155 Team Academic Advisor Leslie Brown said, "The team is made up of a very good group of students. A 3.5 GPA is a very good semester for any high school junior, To do this as an entire team is very impressive and a great indicator of how serious the players take their scholastic responsiblilities." "The big majority of the players are stepping up and taking at least one Advanced Placement class," added Mrs. Brown, "They are doing very well in those classes also, which is a good indicator of how they will do with college classwork." The players are busy planning their class schedules for the 2009-2010 year, along with the preparation and taking of their ACT and SAT tests between now and June. In an uplifting evening in Carmel on February 11, American Legion Indiana State Baseball Director Owen Wells (left), welcomed the Post 155 Baseball team back to the State Legion Baseball scene. Mr. Wells, who drove up from Evansville to be at Post 155 that night, spoke of the heritage of Legion Baseball and the sportsmanship that it encourages. He gave an entertaining review of Indiana Legion baseball during his generation, then focused on the Post 155 players, welcoming them to the Legion Baseball world and then speaking to the importance of scholarship, college prep work, and how important their last two years of high school will be. Before the dinner, each of the players stood before the Post leadership, introduced himself, and recognized and spoke about a family member or friend that has served our country in the military. Among many family members on hand at the Post was Bob Shue, who served as Legion District 6 Commander in 1976 and 1977. He was introduced and recognized by his grandson, Doug Campbell, a Carmel junior on the 2009 Post 155 team. Team Academic Advisor Leslie Brown then spoke and reported on the team's excellent academic record so far this year, and how the players continue to work on their grades and also to get ready for their ACT and SAT exams. The team also announced their summer schedule which includes several home game in Carmel. It was good food, good fellowship, and a sneak peak at the Legion Ball Team that will on the field here in late June. Rooting for the Yankees is like rooting for the house in blackjack. ~Adam Morrow, "Letters from the Nation"